FILE - A woman holds her son, suffering from dengue fever, as she sits under a mosquito net inside a dengue ward of a local hospital in Rawalpindi, Pakistan, October 2015. Predicting an outbreak of dengue fever could be just a phone call away. A telephone helpline is assisting public health officials in Pakistan predict the incidence of the mosquito-borne disease. Researchers have created a computer algorithm that uses hotline reports from the public to help forecast the number of dengue cases, two to three weeks before there’s an actual outbreak. By knowing how many people could become infected, public health officials can take preventive measures to limit the impact of dengue on a community. Lakshmi Subramanian, a professor of mathematical sciences at New York University, said the computer model is extremely accurate. He added that an outbreak can even be traced to particular neighborhoods and blocks within those areas. Subramanian and colleagues described their computer model in the journal Science Advances. An estimated 400,000 people are infected with dengue fever each year. Worldwide, an estimated 2.5 billion people are at risk of contracting dengue, which causes sudden high fever, severe headaches and agonizing joint and muscle pain. Parasite-infected mosquitoes spread the illness, for which there is still no cure or vaccine. 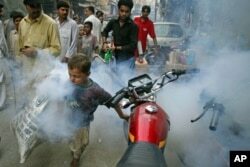 A boy tries to outrun a man fumigating for mosquitoes in an effort to combat dengue fever, on the streets of Lahore, Pakistan, Sept. 20, 2011. In 2011, the Pakistani province of Punjab was blindsided by a severe outbreak of dengue, which infected more than 21,000 people and took 350 lives. Unprepared for the onslaught, hospitals in Punjab were swamped. Since then, researchers in the United States and Pakistan developed a telephone hotline to help forecast the scope of a particular dengue outbreak. The computer algorithm that feeds information from callers into the prediction model. So far, some 300,000 people have called the hotline with questions about the symptoms of dengue. They also report areas where there is still water or open sewage that could be a breeding ground for dengue mosquitoes. The information from the algorithm can be widely disseminated to help hospitals prepare for a dengue outbreak. Proactively, public health workers can eliminate standing pools of water and use insecticides to kill mosquitoes. The authors say the hotline-based system is economical and does not require a huge effort to collect and analyze disease incidence information. The study’s first author, Nabeel Abdur Rehman, said a hotline has also been established to pinpoint outbreaks of polio, a disease that has been virtually eradicated worldwide but for a few remaining cases in Pakistan and Afghanistan. With information from the hotline and disease prevention efforts, the authors say the number of dengue cases in Lahore fell to 1600 cases in 2013.